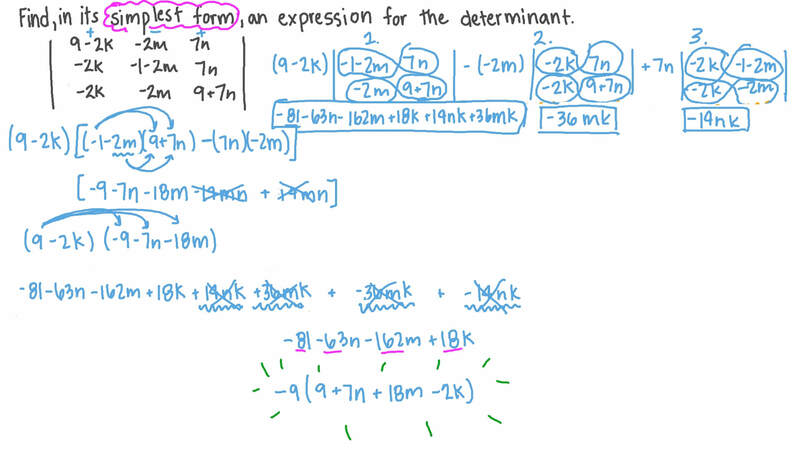 In this lesson, we will learn how to use the properties of determinants to solve problems. Find the value of | | | | − 5 2 − 4 0 5 0 3 0 0 | | | | . Determine all the possible values of 𝑥 given that 0 ≤ 𝑥 ≤ 3 6 0 ∘ ∘ . Consider the equation Given that 𝑎 + 𝑏 + 𝑐 = − 1 , find its solution set. Given that 𝑛 = | | | | 6 − 8 9 1 5 − 9 − 1 1 − 7 2 − 4 | | | | and 𝑚 = | | | | 1 8 − 2 4 2 7 9 0 − 5 4 − 6 6 − 3 5 1 0 − 2 0 | | | | , find a relation between 𝑚 and 𝑛 without expanding either determinant. Put the determinant | | | | − 4 − 5 7 8 − 4 1 6 5 2 2 3 8 | | | | in upper triangular form, and find its value. Which of the following pairs of points does the straight line represented by the equation pass through?